This photo captures the third rocket in the JOULE II series to launch January 19 from Poker Flat Research Range. As part of JOULE II, two pairs of rockets were launched in a series. Each pair included a rocket that released a trimethyl aluminum vapor that glowed in the upper atmosphere, and another full of instruments to track the glowing trails of the vapor as it moved in the winds 60 to 120 miles above Earth. From Poker Flat Research Range north of Fairbanks, four NASA rockets launched into an aurora display over northern Alaska, starting at 3:29 a.m. Alaska Standard Time. Scientists hope to learn more about electrical heating of the thin atmosphere from about 60 to 120 miles above Earth's surface with the launch of these rockets. The project is called JOULE II. Staff at Poker Flat Research Range coordinated with the Federal Aviation Administration to ensure that airspace was secure before launching all rockets. Each rocket's flight lasted about 12 minutes, and all rockets performed as planned, flying to their desired locations in space, with precision greater than 95 percent. Miguel Larsen, a professor at Clemson University, was the principal investigator for JOULE II, which consisted of two Terrier Orions, a Black Brant V, and a Black Brant IX. 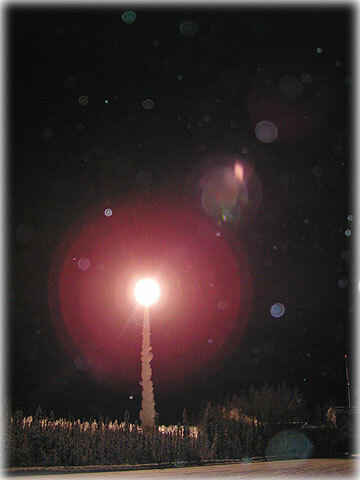 The rockets launched in two pairs-the pairs consisted of one rocket with instruments to read the detailed structure of the electrical currents within the aurora, while a second rocket released a visible tracer of trimethyl aluminum vapor to measure the winds and turbulence at that altitude range. Using sensitive digital and film cameras, scientists watching from Poker Flat, Coldfoot, and Fort Yukon determined how winds in the upper atmosphere contorted the visible tracer. They will use the information to track the winds in the aurora region. The two releases of trimethyl aluminum produced a milky white glow when exposed to oxygen in the upper atmosphere, and may have been visible over parts of Alaska. The instrument packages within the rockets radioed down their information about aurora currents as they flew through them. The rocket payloads landed in locations between Fort Yukon and Arctic Village. Poker Flat Research Range is operated by the Geophysical Institute at the University of Alaska Fairbanks, under contract to NASA. Scientific sounding rockets have launched from the facility since 1969.